Services around the world are becoming more accessible with advancements in technology and communication, and so is healthcare! Today, traveling to another country for medical treatment has become convenient and accessible. Manipal Hospital understands the cultural and linguistic needs of all patients - be it national or International. 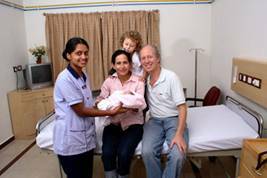 The Manipal International Patient Care Center has been created to meet such needs. Our professionally trained, multilingual staff will work with you to meet your health care needs and make your stay in the hospital as comfortable as possible. The Manipal International Patient Care is a service from India's first multi-specialty tertiary care hospital to be certified ISO 9001: 2000 by TUV Rhineland for all comprehensive protocols including Clinical, Nursing, Diagnostics and Allied Areas. It serves as a single window for high quality medical services and personalized attention with an assurance of a comfortable stay for both patients and their families. For years, the hospital has served a diverse group of patients - from overseas family members to visiting dignitaries and heads of state. The team at the Manipal International Patient Care extends a full range of personalized services to international patients and their accompanying family members. At this one-stop service center, a dedicated team of professional Patient Care Coordinators ensure that every patient's visit is comfortable, pleasant and hassle-free. The International Center takes care of the minutest details, so you can focus on getting back to the best of your health. "I have found the hospital to be of superb class standards with wonderful administration as well as the staff here in the hospital. the doctors have been nothing but complimentary. I am very grateful to Manipal Hospital". "I am delighted with the way we were received here, the way people understood our problem, the way they are very sensitive to the suffering of especially the poor people and children. I find this an exceptional experience. I cannot tell otherwise". "At Manipal Hospital, one thing that made the biggest impression on me was the doctors' total devotion and commitment to their patients and work. At Manipal Hospital, the doctor-patient relationship is so good that it contributes a substantial percentage to the healing process of the patient"
"Manipal Heart Foundation has a very powerful team and expertise in treating maladies like the TGA (Transposition of Great Arteries). We are very happy and for ever thankful to the doctors, nurses and all the staff of Manipal Hospital for being very helpful and supportive to my baby." "When I arrived at the Manipal Hospital, my reception was wonderful. The doctors were very attentive, very gracious and the nurses were unbelievably caring. Everyone in the hospital has been absolutely first-class. I can't stress just how much." "It's been first-class treatment from day one, from the nursing staff, the surgeon, administration. it's been excellent; I think, much superior to what we would have received in the UK. The operation I had at the Manipal would have been four or five times more expensive in England. It's an excellent service and everything is catered for. We made some very good friends here." "It was very easy to contact people here. Because of my experience in the dental business before, I have no hesitation in saying that this is a world-class dental facility. My wife and I are delighted with the treatment we've had here. We have the highest confidence in Manipal Hospital. "